2.5. 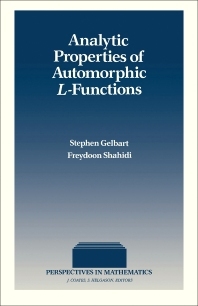 The General Set-Up: Eisenstein Series, Constant Terms, and Langlands' "Euler Products"
Analytic Properties of Automorphic L-Functions is a three-chapter text that covers considerable research works on the automorphic L-functions attached by Langlands to reductive algebraic groups. Chapter I focuses on the analysis of Jacquet-Langlands methods and the Einstein series and Langlands’ so-called “Euler products”. This chapter explains how local and global zeta-integrals are used to prove the analytic continuation and functional equations of the automorphic L-functions attached to GL(2). Chapter II deals with the developments and refinements of the zeta-inetgrals for GL(n). Chapter III describes the results for the L-functions L (s, ?, r), which are considered in the constant terms of Einstein series for some quasisplit reductive group. This book will be of value to undergraduate and graduate mathematics students.